Hey Babes, I hope you’ve been having a great start to May so far. I’ve had a very busy, and very good beginning of May. There’s been some really great meetings , fun exercise classes (I actually did a handstand in bowspring yoga, it was against a wall, but awesome nonetheless! ), and I went to an awesome event that was put on by some of my business network #BossBabes, Tammera Merkens, Sofia Pastro, and Molly Ashlie. They have some awesome, inspiring Facebook groups that have been the first groups I found since the YearOfYou group that I really like, they’re #BeBraveBoldAndBeatiful, and Moss Photography VIP Empowerment Club. The event was called Be Your Best Self and was filled with pampering services, and lots of great tips, and I always love getting together with other women and taking the time to focus on us and having fun. I’ve been attending and sponsoring more and more events like this and it’s always so much fun and inspirational and empowering. Today I learned some great beauty and photo tips, and I always find my other #BossBabes to be super inspiring by rocking it with their own businesses and overall lifestyles. But enough about that, let’s get on with the outfit…. I’m generally not the biggest pattern mixer, but I really like the look and have been trying it out more often. The only thing is, once I started make more of an effort to mix patterns I realized I don’t own that many patterned items, which is great because now I have an excuse to go shopping! For this outfit I mixed my patterns with a super comfy striped tshirt paired with a super cute floral bag my bestie Bella gave me that I can’t stop wearing (I’ve linked other cute floral bags here, here, and here). Accessories are a great way of testing the waters of pattern mixing before going head first into bolder, full body pattern mixes. 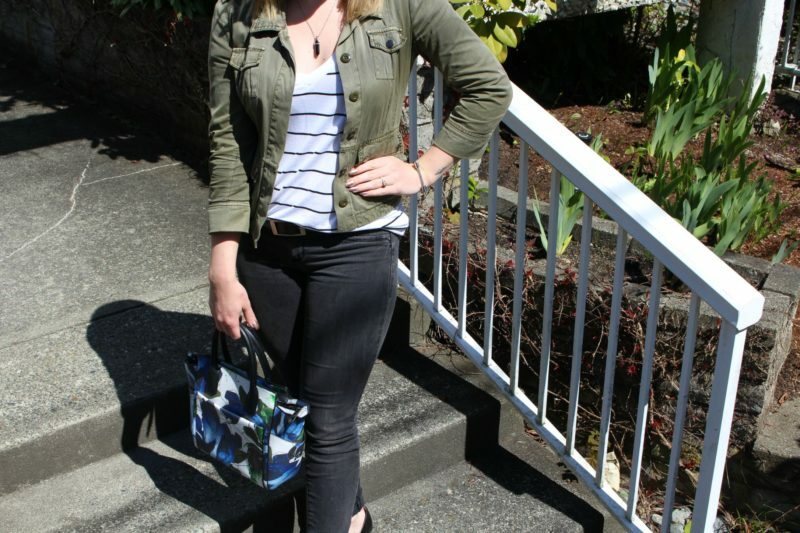 I paired it with some black jeans, and used this versatile utility jacket as my 3rd piece. Military style jackets are a great wardrobe staple to have in your closet. They can be paired with cute jeans and tshirt outfits like the one below (jeans and tshirt outfit styling tips here), or elevate a cute leggings or athleisure outfit (leggings styling tips here), or layer over a flowy summer dress or tshirt dress. I could go on and on with examples, but I think you get it, military jackets are versatile af. There ya have it, a few tips for mixing patterns as I start to venture into the pattern mixing game more and more. Stay tuned next week for a bolder pattern mixing outfit, and this Friday I’ll show you how to do a nice no-makeup makeup look. You know me I love to mix my prints haha! I love the classic stripe and floral combo! Love the look! Floral and stripes are always a great choice! Thanks Laura. They’re a great place to start when mixing patterns. Oh I just LOVE those shoes! I am a sucker for anything pointy, haha! Thanks Natassja. They’re such a great classic shoe! Thanks Lauren. They’re such a great classic style. I adore florals and stripes! And I need those loafers in my life. Thanks Vanessa, I’m so in love with loafers! Mixing patterns is my fave! You did it beautifully!!! Thanks Nicole. It was my first try and I’m in love! i totally love mixing prints too! It’s just another great way to have fun with clothes! Such a great look! Love the bag! Thanks Emily. I love it too! This is a great look! I love that you used your bag for the second print! Cute! Thanks LaToya! It’s a great way to get started with mixing patterns.